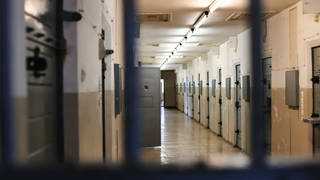 “A Monster of a Facility”: Amid Manhunt for Fugitives, Advocate Urges Reforms at Dannemora Prison | Democracy Now! human rights and prison reform advocate, founder of Incarcerated Nation Collective, a collective of previously incarcerated people. He was formerly incarcerated and spent 11 years in New York’s prison system for criminal weapons possession and other charges. During that time, he was held in solitary confinement for a total of five years. AMY GOODMAN: On a slightly separate issue, I’m just curious, Five Mualimm-ak, if you have thoughts about the prison break that is getting so much attention today, entering its something like seventh day, of two prisoners at Dannemora, at the Clinton Correctional Facility. FIVE MUALIMM-AK: Yes, Clinton is a monster of a facility, between the annex and the main. It is a—the most historical torturous beatings there, right? It is a place that is so far away. AMY GOODMAN: Something like 3,000 prisoners. FIVE MUALIMM-AK: Right, exactly. It’s so far away that we actually help and try to support a prison visiting project that Osborn does, as well. The visits are so hard to happen, we have a video visit project. But this is a facility that is historically known for its abuse, has no accountability. They have cameras and certain things in certain areas that are not necessary. So it is not a place that is totally accountable in its own construction. And it’s like, you know, a half-hour away from Canada. This place needs to be changed. There actually was some good programs there. There was residential humane units there before. And it’s staffed by people who are undertrained. We have 57.7 million people that suffer from mental illness in this country, and we do nothing to train the officers who have care of people every day. AMY GOODMAN: Finally, Christie Thompson, you wrote about Rick Raemisch, right? AMY GOODMAN: The director of corrections in the state of Colorado, who himself went into solitary confinement. CHRISTIE THOMPSON: Yes. So, Rick has worked a lot on addressing the issue of people coming straight from solitary confinement back to their community, because there was a tragic case in Colorado in which someone who was accidentally paroled early from a segregation unit, where he had been—spent years completely by himself and actually had written grievances to the prison, saying, “Don’t you have some obligation to prepare me to come out to the world? If you allegedly think I’m so dangerous that I can’t be among other inmates, how can I be, you know, out on the streets among other people?”—he was accidentally released and ended up murdering the former head of the Colorado prisons department. So, after that, you know, there has been zero people that have been released straight from solitary in Colorado, since March of last year. And they’ve created new programs and two new units. And I think, when I was interviewing Rick, it sounded like he became very aware of what solitary can do to someone, after spending only 20 hours by himself in a cell. AMY GOODMAN: Well, I want to thank you both for being with us, a powerful testimony today, and we’ll link to your article at democracynow.org. Christie Thompson, staff writer at The Marshall Project, her new story headlined “From Solitary to the Street: What Happens When Prisoners Go from Complete Isolation to Complete Freedom in a Day?” And thank you so much to Five Mualimm-ak, a human rights and prison reform advocate, founder of Incarcerated Nation Collective, a collective of previously incarcerated people. He was imprisoned himself, spent 11 years in New York’s prison system. During that time, he was held in solitary confinement for a total of five years. This is Democracy Now! When we come back, we go to Ramallah, on the West Bank, to speak with a film director who was supposed to be here in New York at Lincoln Center for the premiere of his film Saturday night at the Human Rights Watch International Film Festival. We’ll learn about Israel and the United States’ role in preventing him from being present. Stay with us.